A deepening trade dispute between the United States and China weighed on global stocks and bond yields yesterday, but a rise in Apple shares took its valuation above $1trn (€861bn), the most for a US-listed company, and helped lift some US indexes. Apple's breaking of the $1trn barrier led a rebound in technology stocks that helped key US indexes pare earlier losses to turn positive. FAANG stocks - Facebook, Apple, Amazon, Netflix and Alphabet's Google - are the market's five most popular and best-performing tech stocks. "It's certainly a tremendous achievement to create a company with a $1trn market cap," said Peter Tuz, president of Chase Investment Counsel in Charlottesville, Virginia. Still, he said, "it's just a number". The tech company's stock jumped 2.8pc to as high as $207.05, bringing its gain to about 9pc since Tuesday when it reported quarterly results that beat expectations and said it bought back $20bn of its own shares. On Wall Street, the Dow Jones Industrial Average fell 36.87 points, or 0.15pc, to 25,296.95, the S&P 500 gained 9.06 points, or 0.32pc, to 2,822.42 and the Nasdaq Composite added 69.55 points, or 0.9pc, to 7,776.84. 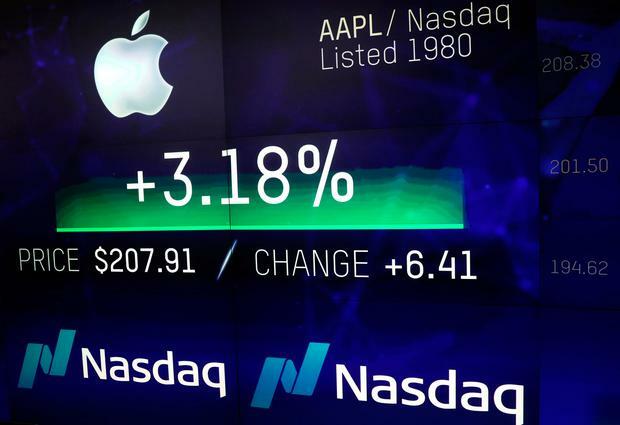 The Nasdaq and benchmark S&P indexes had opened lower yesterday, but began to turn positive as the advance in Apple shares took the focus away from the trade dispute. Still, concerns remained over the US-China trade spat, which intensified on Wednesday after US President Donald Trump raised pressure on China by proposing a higher 25pc tariff on $200bn worth of Chinese imports. China yesterday urged the United States to "calm down". In Dublin, the Iseq fell 1.3pc to 6,737, with Aryzta's 9.6pc drop the biggest decline. IFG fell 7.1pc to €1.44 a share.